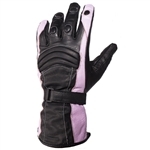 Leather Bound Online offers a full selection of high quality riding gloves for women. Our lined leather gloves will keep your hands warm and protected while riding this winter. Don't forget to check out our full selection of women's motorcycle apparel. A pair of warm motorcycle riding gloves are essential for riding in cold weather, there is nothing worse then having ice cold hands. Our selection of ladies insulated leather motorcycle gloves offer warmth, comfort and style with riding. Choose from cute styles with pink or purple trim and unique butterfly embroidery.